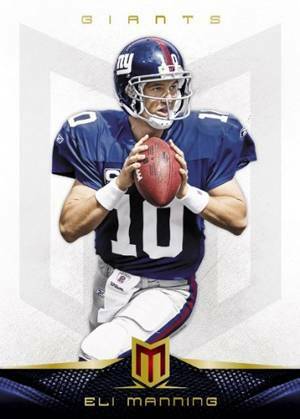 2012 Panini Momentum Football is another resurrected brand from the Texas-based card maker. It is a high-end product aimed as much at pack buyers as it is box busters. 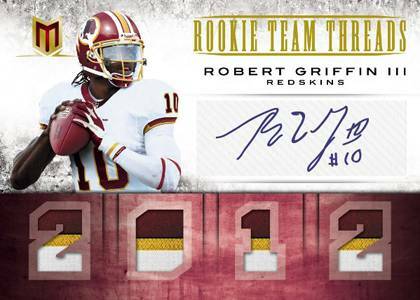 Every pack comes with either an autograph or memorabilia card with a lot of focus aimed at the deep 2012 rookie crop. 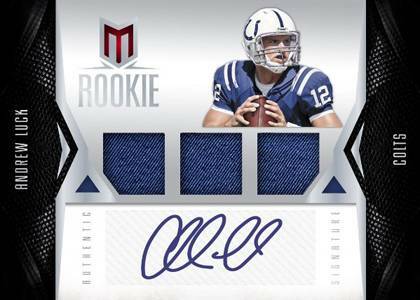 Landing one per box, Momentum Rookie Signatures RPS rookie cards come with both an autograph and a three swatches of player-worn, not game-used, memorabilia. 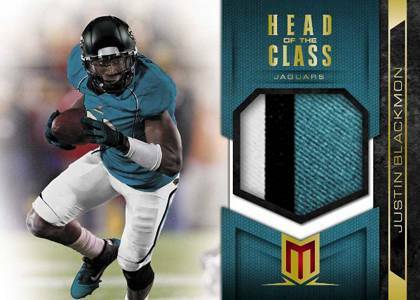 Sticking with the first-year theme are Head of the Class Materials, which come with up to four swatches, and Rookie Team Threads that have an autograph and four memorabilia pieces. 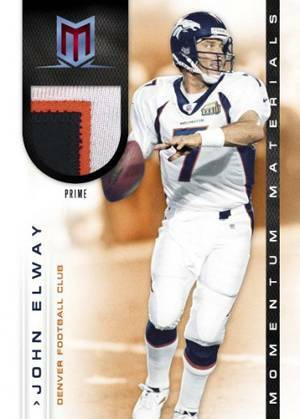 Veterans aren't left out of the 2012 Panini Momentum mix. Neither are retired legends. Harkening back to the days of Action Packed are Studs, which use real diamond bling to represent a player's earring. Souvenir Signatures has autographs from both current and past stars. Momentum Materials follow a similar format of past and present, only with game-used memorabilia instead of autographs. 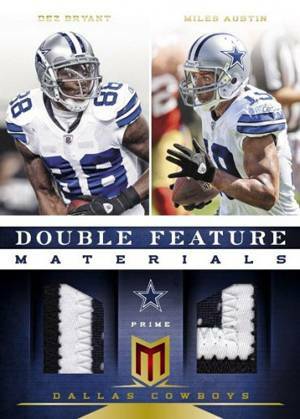 Double Feature Materials pair players together with two or three swatches. 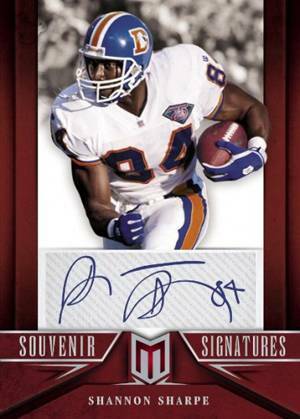 The 2012 Panini Momentum base card design is fairly simple. It is highlighted by a large player photo with the Momentum logo shadowed in the background. The team name sits quietly at the top of the card while the striped nameplate at the bottom adds some modern pop. Base cards have Printing Plate parallels. A bit hard to score on of the big names but nice cards overall. I think Momentum was a great product. I love how there was a hit in every pack. For $200 a box getting 10 hits makes it worth the money. I hope they bring it back next year! I was able to afford a single pack of this product. Love the thick stock and the patch card was nice. Main issue is it can be a “hit or miss” like a lot of products with a high pack price. I loved my nice patch card but value to pack price was not even close. Awesome high quality photos. Great designs. As some people have previously stated great hits are hard to come by, and when paying the price you have to to get a pack or box you would hope for a little better chance of getting a great hit. The corners are very thin and sensitive with this product. Have seen many cards with the corner paper dinged. not sure why this product isnt a little better recieved? it different than almost everything out there. i like the white backround and the pictures are great compared to the 15 other football products out there…the team threads are some of the best rookie cards i have come across. I purchased the last two packs at my local hobby store and I’ve come away with intrigue of how other high end products will come away with a sense of excitement as Momentum has brought me. I actually really love the base card designs, especially with the subtle M in the background. That’s not to underscore the hits that come with every pack! Great card stock, I’m a stickler for thick cards, and the print design on every card was done with exceptional and meticulous input. Even my wife was excited with my purchase, in fact she inquired on another Panini product that was on display! Uh, Oh! Will I be surprised with a box of Panini Black! 2012 PANINI MOMENTUM Football Factory Sealed HOBBY Box Luck Auto ?